How to avoid expensive outbound faxes? The number of pages in an outbound fax is not the only factor that determines the time it takes to transmit. The actual size(in bytes) as well as the quality of the originating document influences the transmission time dramatically. Highly pix-elated files, or files of poor originating quality will take longer to render or not render at all. Pictures and logos in particular. If the file is damaged or the paper has creases it will also manipulate the transmission time dramatically. Fax technology interprets any image as series of a black and white dots, a granular image plays a major role in the time taken to transmit and receive. A standard black and white fax image consists of a grid of pixels at fixed resolutions and image sizes compressed in a particular manner. The number of pixels in the image depends on the vertical and horizontal resolutions (dpi or pixels/mm) and the size of the image. The size of the image (in bytes) depends on the image dimensions, resolution, content and the form of data compression used. Basic fax mode transfers in black and white only and the document is compressed into a series of black and white runs for a single scanned line. the compression ratio would have been far lower during this transaction. If this is the case we suggest that you decrease the size of the document(in bytes) or find a better quality version of the originating document. This service is absolutely free of charge. There are no monthly maintenance costs and no signup fees. 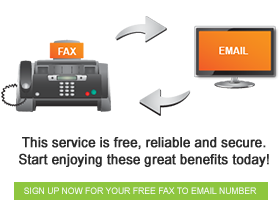 A minimum of 1 fax every 30 days needs to be received to keep your account active and open.Is sending faxes from my email address also free? How do I buy FaxOut Credits? How much does sending a fax cost? Please refer to the FaxFX FaxOut rate sheet, which can be viewed on our website(note: our rates may be subject to changes without prior notification). Will I need to install any specialised software? Faxes are received as either a PDF or TIFF file. Most commonly used operating systems are equipped to handle these formats, but the relevant software can also easily be downloaded from the internet. How long will it take you to assign me a fax number? There is absolutely no delay. Once you have registered an account, you are assigned a number and are instantly ready to begin faxing. Can I still register if I do not have access to the internet? If you send an email to support@faxfx.co.za from wherever you do have internet access, we can will automatically invite the email address that you are using. How can I activate or accept an account by email? This is done by clicking the “accept” button which is found in the activation email. You will receive this email as soon as you sign up for our service. How does FaxFX make money if they offer these services for free? We earn our revenue through a rebate system with Telkom, earning for each call made to the designated numbers. This is how we can deliver top service to our clients at absolutely no cost to them.